There will be a mandatory preseason wrestling meeting in the wrestling room on Friday immediately after school. All current fall athletes are required to attend and your coaches have been notified and are fine with it. The meeting will be brief and will discuss paperwork and Fall conditioning and weightlifting. Harriet Symington earns All-American Honors! Posted on July 19, 2011 | Comments Off on Harriet Symington earns All-American Honors! Whitman’s own Harriet Symington earned a 5th place finish in the recent Fargo (N.D.) Nationals Womens Freestyle competition. Harriet wrestled in the 101 pound weight class of the Cadet age group. Harriet is the Maryland’s first female wrestler to take All-American honors at Fargo. In addition to placing 5th Harriett also beat the weight class runner up in group wrestling. Each weight class is split up into different groups with the top finishers in each group moving on to the placing rounds. Congratulations Harriet! Comments Off on Harriet Symington earns All-American Honors! Seniors Eric Harder (130 lbs) and Andrew Follmann (152 lbs.) have been named to the All Gazette first team for the 2011 season. Both Harder and Follmann won County and Region titles at their respective weight classes. Eric Harder placed 3rd at the State Tournament for the 2nd consecutive year while Follmann placed 4th at States for the 2nd consecutive years. Harder finished his career with 95 career wins while Follmann finished his career with 115 career wins. All Whitman wrestlers are required to come to the Whitman parking lot on Saturday, March 26th at 3:30 to help out in the annual Whitman Athletics Mulch Sale. The format is a little different this year. We will not be making home deliveries. We will only be helping to load cars at Whitman. This is a mandatory team activity. Whitman Places 11th at States! 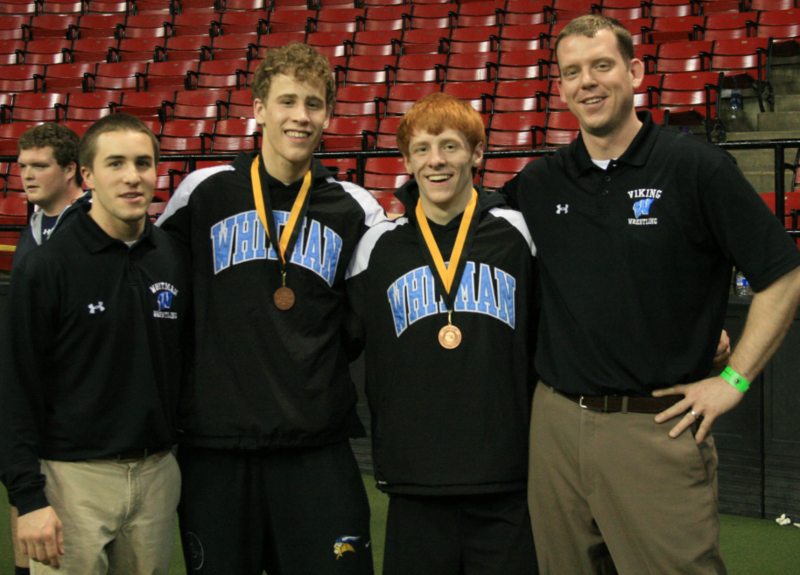 Posted on March 7, 2011 | Comments Off on Whitman Places 11th at States! Whitman qualified six wrestlers for the State Tournament which is held in Cole Field House at the University of Maryland. Seniors Eric Harder and Andrew Follmann capped fantastic careers each with a second consecutive placing in the top 6th. Eric wrestled extremely well in placing 3rd at States for the second consecutive year. Each year Eric’s only loss at States came to the eventual State Champion. Andrew matched Eric’s 4 wins at the State Tournament in placing 4th for the second consecutive year. Andrew capped off his career as a 4 year varsity starter with 115 wins. Eric finished his 3 years on Varsity with 95 career wins. Senior Mike Harder and Senior Ned Daryoush narrowly missed out on placing. Both wrestlers went 2-2 at the State Tournament. Joining them was Junior Josh Daryoush who also went 2-2. Junior, Region Champ, Brad Taylor went 1-1. Unfortunately he was injured in his second match on Friday night and was unable to continue on Saturday. Congrats to all Whitman wrestlers and all the Whitman State placers and qualifiers for having a fantastic season!! Comments Off on Whitman Places 11th at States! Whitman Wins 3rd Straight Region Tournament! Posted on March 7, 2011 | Comments Off on Whitman Wins 3rd Straight Region Tournament! 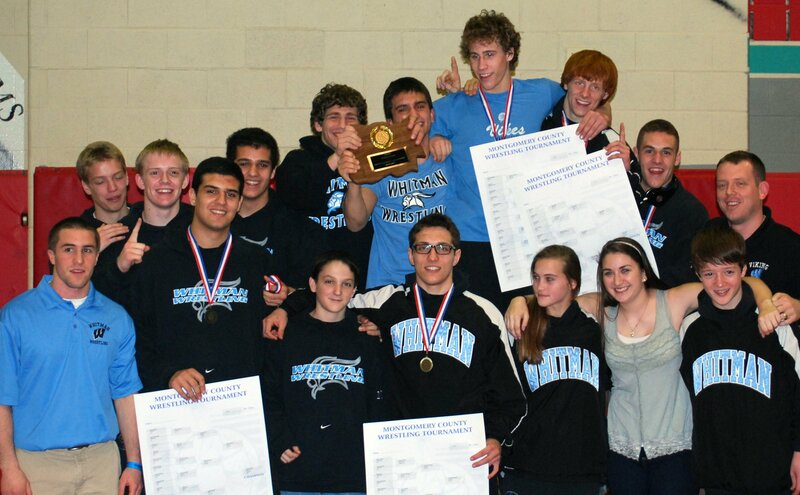 The Whitman wrestlers came into Sherwood for the 3rd straight year and brought home the Region title. Whitman tallied a winning total of 131 points. That outdistanced 2nd place team Magruder who had 103.5 points. 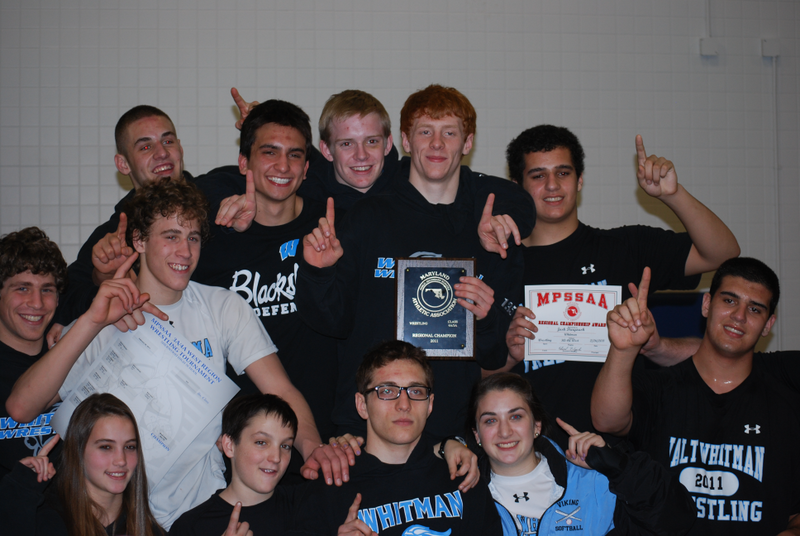 Whitman was paced by a total of four champions. Leading the way once again were Senior Regions Champs Eric Harder at 130 lbs., Andrew Follmann at 152 lbs., and Ned Daryoush at heavyweight. All three wrestlers were also County champs the week before. Joining them this week on the top of the medal stand was Junior Brad Taylor at 171 lbs. Brad continued winning streak with a close 3-2 decision in the finals. All four wrestlers qualified for the state tournament at Cole Field House at the University of Maryland. Joining Whitman;s four champs in qualifying for States is 2nd place finisher at 140 lbs. Mike Harder and Junior Josh Daryoush at 215 lbs. Alex Hysong placed 5th at 160 lbs. Comments Off on Whitman Wins 3rd Straight Region Tournament! Posted on February 20, 2011 | Comments Off on Vikes Win 2nd Straight County Title! Comments Off on Vikes Win 2nd Straight County Title!